A mission is a powerful force. It is a deeply held purpose that focuses individuals and unifies organizations. For individuals it is a duty for which they have been tasked to fulfill. For organizations it is the reason to exist. Do it right and your entire workforce embodies a passion and commitment that defies logic and exceeds all expectations. In P&G some of the businesses use a concept called the "Compelling Business Need" or CBN. The problem with the CBN is that, more often than not, it's a slogan that leaders say in a "compelling" voice. Just because a CBN is stated urgently doesn't give it a sense of urgency. I'm all for focus and purpose, but I've never liked CBN's. Mission is only compelling when it means something to the person fulfilling it. I learned from first hand experience what it looks like when every person, in every position, sees themselves as a critical part of driving the business mission. Pat was my plant's occupational health nurse in a facility in Northern California. Most Health Service departments are known for championing employee health and wellness, not for driving the business mission. But this Health Services department was different. Pat was on a mission to enable the business by enabling health and safety. Our plant produced popular brands in a very competitive market. 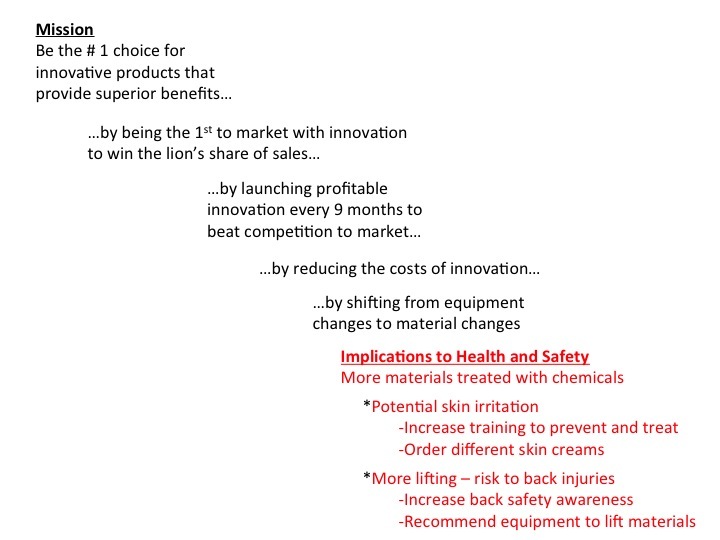 Competition launched new products every 12 months because the product first to market was rewarded with the lion's share of sales. We started to launch innovation every 9 months. The cost was extremely high because new equipment was installed with each launch. The cost was unsustainable, and a new strategy rolled out to innovate with materials. At the time Pat worked for me. I explained to her how the business grew through innovation, but it wasn't affordable. I shared that the new strategy was to innovate with different materials with new chemical properties. I asked Pat how the business change would impact her job. Pat started by writing down the business objective, and then linked it to a more specific business action. She kept stepping the actions down in a series of increasingly specific activities until she made a link to her role. When she got to her role she said, "it sounds like the operators will be exposed to new chemicals in the materials. There could be an increase in skin irritation. I'll have to increase training on how to prevent and treat contact dermatitis and I'll order new skin creams. I'll also increase back safety awareness to prevent lifting injuries especially if there are additional materials. We should recommend installing automated lifts to assist the operators when they load the material." Afterwards when Pat interfaced with an employee, she'd start by drawing a connection between the business strategy and why we needed to be more vigilant about back safety and skin irritation. She asked all employees to help her enable safety to enable the business growth. How many times have your heard of an industrial occupational nurse driving the business mission and relating it to her job and to others'? Pat was on a mission. And every time she spoke, she reinforced it. That is mission with meaning. Do you want your mission to have more meaning? Take the time to cascade the business strategy step by step and connect every person to the mission. Show them how their work matters to the business. Your organization will be instilled with purpose and focus, and everyone, from the plant nurse to your most senior leaders will feel compelled to fulfill the mission. Thanks Uncle Procter. Now that means something! Interested in learning more about leading organizations? Take a look at Leadership Lessons from The Who's Magic Bus by popular coach, Jim Keighley.